Join our camera crews as we show you the 8444 cresting the Blue Mountains of Oregon, tripping along the Columbia River and leading a special excursion down Oregon's magnificent Deschutes River Canyon on the "Inside Gateway" route. Finally we follow this mighty 4-8-4 back over the Blue Mountains and across Idaho and Wyoming home to Cheyenne, Wyoming. In the second half of this 2-in-1 tape, you'll see Southern Pacific's beautiful "Daylight" 4-8-4 No. 4449 as she leads a special promotional train heralding the merger of Southern Pacific and the Rio Grande Railroad. This train operated over one of the most scenic lines in the west - the famous Siskiyou Line, renowned for its tortuous curves and steep grades, and still protected by ancient semaphore signals! 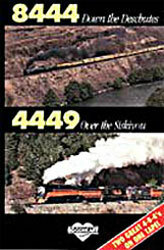 The 4449 provided red and orange action galore in the green mountain forests of Oregon as she put on a magnificent show!